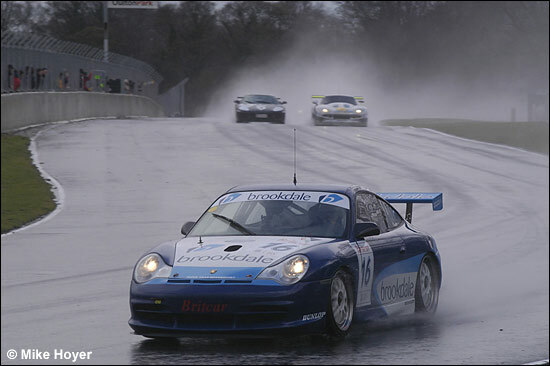 Rain, hail, and a biting wind conspired to influence the result of Saturday’s 120-minute Britcar race on the full Oulton Park configuration, leaving Pete Morris, who hadn’t yet handed the 911virgin.com Porsche 911 over to owner Henry Firman, the overall winner, after the race was red-flagged shortly after half-distance. 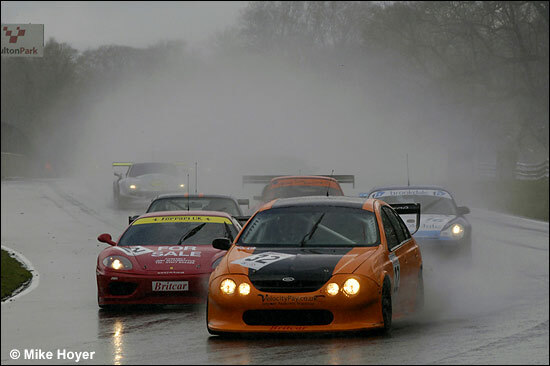 The conditions, which literally changed by the minute, caught out the entire field at one time or another, and with rivers running across the track at several points, and some cars badly damaged, the officials called time on the proceedings. Pete Morris nailed third on the grid, and GT Cup pole, the burly midlands construction magnate satisfied with 1:48.565, but still thinking he could do better. 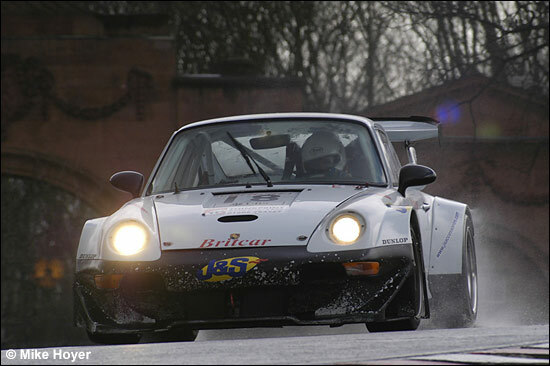 Henry Firman, who had but a few laps before the session was curtailed, rued the traffic; “I was well off the pace – about 35 seconds – and held up by the silver Saab, which was weaving all over the place.” That was the safety car, Henry, driven by ex-Tuscan Challenge and British GT racer Chris Maries. 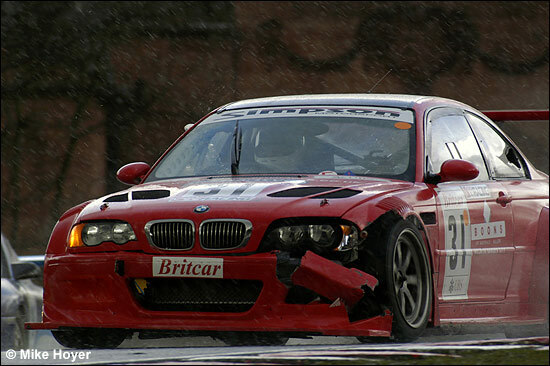 18 GTC Fothergill / Benett BMW M3 no time. 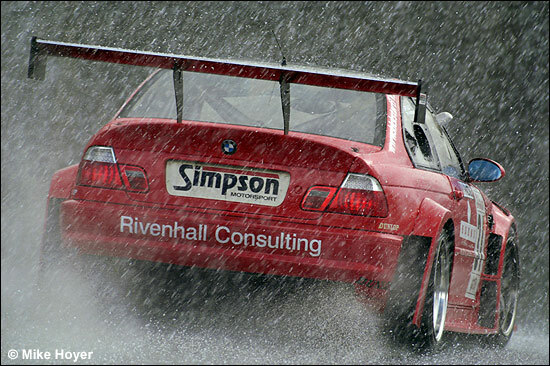 Intermittent hail and rain made for a tricky start to the race, and Jeff Wyatt pitted at the end of the first of the two pace laps, for more appropriate rubber on the Simpson Motorsport BMW M3. 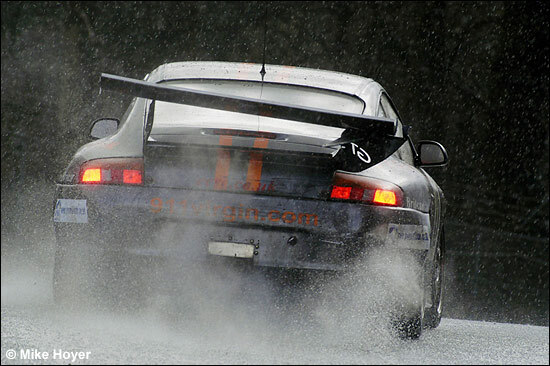 With the rain now pouring, the field filed into Old Hall in grid order once the lights turned green, though Chamberlain was impatient, and powered the big orange Porsche through into second during the opening lap. 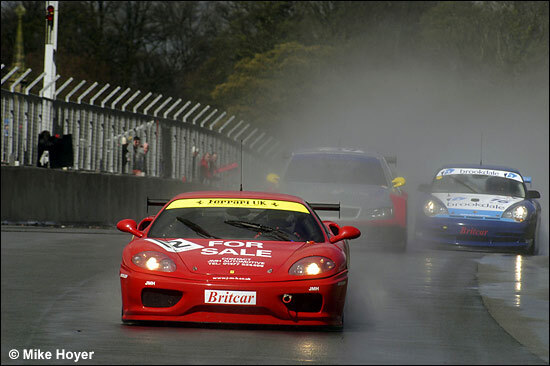 Adam Sharpe took the lead, as Phil Burton, starting the red JMH Ferrari 360, slipped back. Darren Dowling was the first retirement, the ex-Tuscan Challenge man’s specially built machine, with the double roll-hoops poking through the hardtop, succumbing to technical problems. 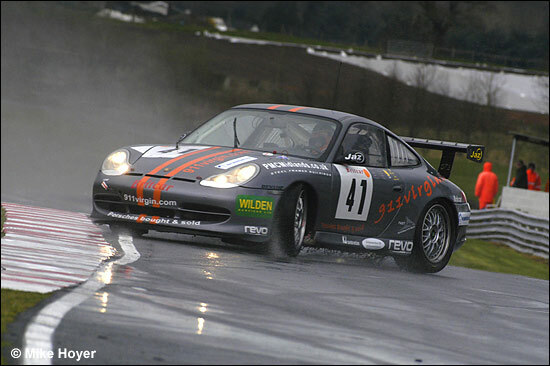 Chamberlain had attached the front of his Porsche to the rear of Sharpe’s leading Falcon, the two orange cars less than a second apart, and dragging themselves 20 seconds clear of Morris’s third place GT Cup Porsche. 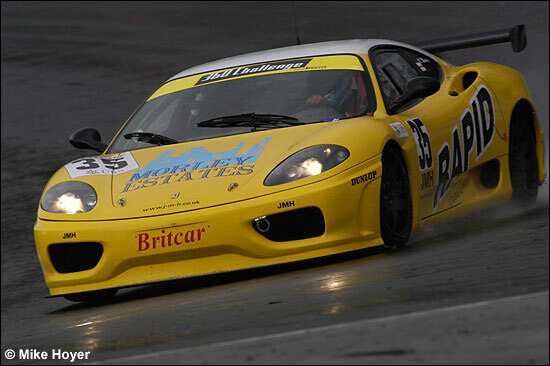 Oliver Morley had sensationally hauled the yellow JMH Ferrari 360 up the order into fourth, ahead of Michael McInerney’s Porsche, and David Back in the Damax Ferrari. From their back row positions, Peter Cook’s Porsche 911, and Sebastiani’s F40 were also making impressive progress. With just six laps on the board, Sharpe spun the Falcon at Knicker Brook, and was stationary on the grass. A lap later, Jon Harrison’s Topcats Marcos Mantis went straight on into the barriers at Old Hall, removing a sizeable portion of the tyre wall, and causing the deployment of the safety car. “Something broke, in the steering or suspension – I was a passenger,” said a shaken Harrison later. 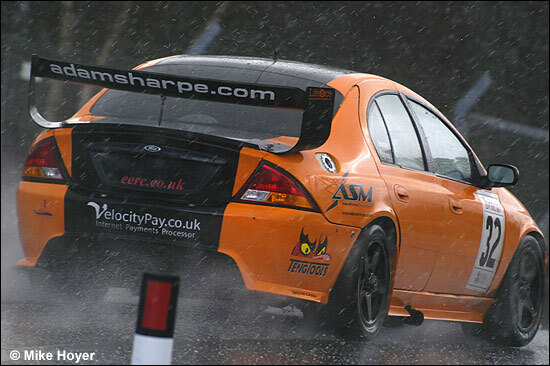 Three laps, and the safety car was in, by which time Sharpe had restarted the Falcon, and brought it back to the pits. After a check-over by Graham Nash and the team, Adam was back on track, though now five laps down. So, with half an hour gone, Chamberlain (above) held an eight second lead over Morris, with Morley a further five seconds adrift. The conditions were worsening, the Knicker Brook Chicane escape road providing a useful diversion for those unable to keep on track, Jeff Wyatt and Jacopo Sebastiani being among them. Wyatt became embroiled in a side-by-side encounter with erstwhile team-mate Mick Mercer, the Topcats team’s cheers drowning the sound of passing cars when the silver Mantis finally slipped inside the red BMW into Old Hall. With Michael McInerney in #16 having slipped back to twelfth, the middle-order was being shaken up. Phil Burton was recovering well after a cautious start, and was fourth, responding to the pressure of Peter Cook’s 911, and Mark Smith‘s BMW had caught and passed Sebastiani. Steve Hall had started Nigel Mustill’s Opel V8Star, but the big car’s big owner didn’t take over when the car pitted after 20 laps. Burton’s response to Cook was to no avail, the plain white Porsche (above) seizing fourth, and, with three quarters of an hour gone, Ben Aucott was the first to make a scheduled stop. The novice had elected to run the ProductionS1-spec BMW M3 in Britcar as well, to gain experience and maximise track time. The Mercer / Wyatt contretemps was far from over, and the pair clashed, the Knicker Brook escape road once again providing the get-out clause. Both continued with slight damage, though Mercer wisely came in for checks, and to hand over to Rupert Bullock, the race approaching its mid-point. Chamberlain pitted too, John Allen taking the 935 out for its middle stint, since two stops were required. A sudden, massive, hail storm then saw virtually the whole field have some kind of spin or slide, the track covered in white marbles. Cook failed to make it round Cascades, and sensibly sat it out on the short circuit until Morris and Sebastiani had passed his point of re-entry, not gaining an advantage. This didn’t satisfy the officials, however, who docked him a lap. Bullock’s Marcos came hurrying down the pit lane, the bonnet missing, and was straight into the garage to retire. That bonnet was a significant loss, since it had innovative Topcats engineer Brian Howard’s latest development dive planes attached to it, and the crash ended an atypically dismal race for the team, losing both cars with damage. “It was my first lap out of the pits, and I wasn’t even on the power, it just went,” explained Bullock. The hail stopped as suddenly as it had started, and, the race being exactly half-run, many elected to make their mandatory pit stops. Morris, Sebastiani, and Cook – the top three – elected to stay out a little longer, exercising the maximum 65% EERC rule. Oliver Morley, driving alone in the yellow #35, had pitted during the storm, and in fifth, was caught out by another sudden, and even more intense deluge, hitting the tyre wall heavily at Knicker Brook. 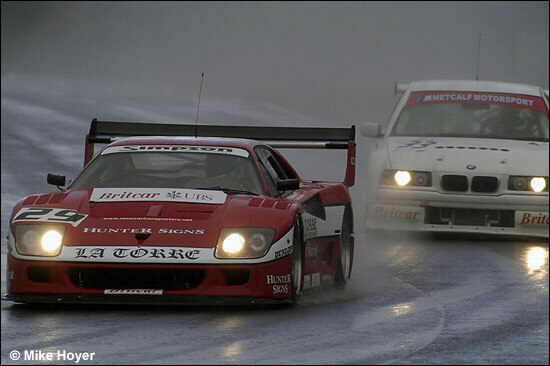 Again, few escaped some kind of “moment”, and the appearance of the safety car was followed immediately by the simultaneous display of both the red and chequered flags. By now, the hail had once gained stopped, but both running and standing water made continuation of the race far too dangerous. With the clock stopped at just over 63 minutes, and some cars not having made their mandatory stops, the officials deliberated before declaring the positions on track stood, awarding the win to Pete Morris and Henry Firman’s Porsche, with the Sebastiani / Mott Ferrari second, and the Cook / Pelle Porsche third, none of the second drivers actually having driven. It was a disappointing race for the “maxxed-up” BMW M3s, neither being classified as finishers. 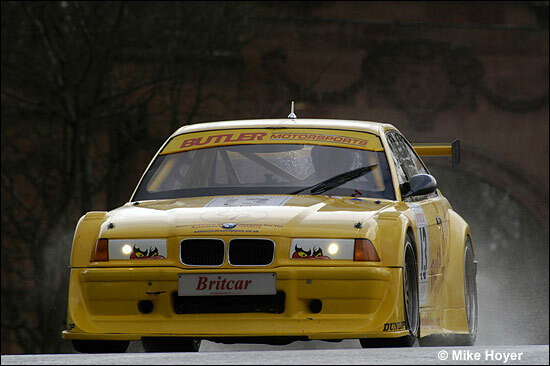 The yellow Butler Motorsport car of Tony Bown and Ian White, and the Torquespeed machine of Fothergill and Benett were still running at the flag, but too far back to be classified.